Hello! How was your Thanksgiving? I wanted to share some awesome black friday buy worthy sales going on - all (well, most) of these shops are offering 50% off their store! Happy shopping friends, have a lovely long weekend! 1) Olive Manna - an amazing sale going on: get a free gift certificate or 50% off your entire purchase! read the details here! 2) Tulle - 50% off everything sale! Lots of cute winter coats to keep you warm. 3) Chronicle Books - Okay, it's not 50% but it's 35% + free shipping! Lots of great books that will make great gifts! Use code "FRIENDS"
4) Sumiko Shop - 40% off the entire shop! I love everything from this shop, use code "BFCM2010"
5) The Modern Marigold - 50% off all skirts + DIY bunting kits! Prices as marked. 6) A Life through the Lens - Buy 1 get 1 free! Off the entire shop! 7) Clever Betty - 50% off the shop, prices as marked. 8) Gaby Burger - 50% off the entire shop, use code "BLACKFRIDAY50"
BrideBlu - 50% off sale! Use code "blackfriday50" at checkout. Suzannemade - 50% off one item! Use code "ohhelloblackfriday"
Urbanite Jewelry - 50% off the shop! All Things Jane - 50% off entire shop! 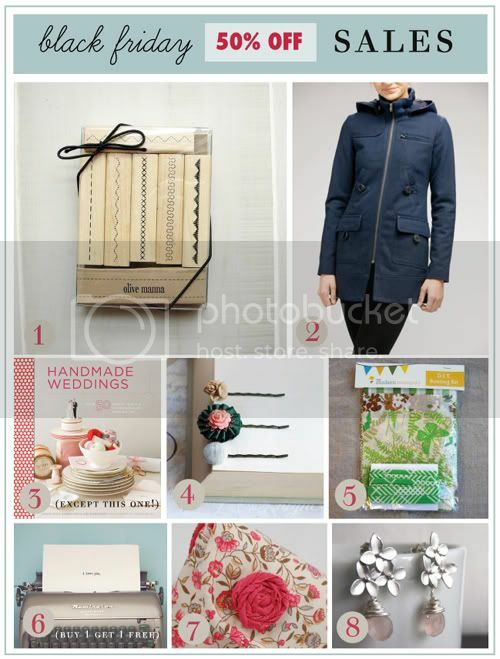 * Visit paper n stitch for a huge black friday shopping guide too! It's almost 4am in Dallas and I didn't buy anything during Black Friday shopping with the husband and friends, but after coming home I was ecstatic to see the sales and purchased Creative Inc. from Chronicle Books and a bunch of goodies for my invitation business from Olive Manna! Thanks SO much for sharing Danni! 20% Discount for 5 sets of notecards or more! Thank you and enjoy your wonderful weekend!! And there's also a sale over at One Fine Dae for 30% off! Enjoy and happy holidays Danni! thank you for including my shop! There are also free shipping! What great stores!!! I am also offering a discount of 10% off all day today, just enter coupon code BLACKFRIDAY at checkout! So many great online sales this weekend, I'm happy to avoid the crowds! Our shop - City Chic Country Mouse - is having 15% off everything with the code THANKS2010 through Monday Nov 29th. Happy Shopping! I'm finding so many awesome gift ideas just browsing on blogs today, yours is no exception. It's like a fun treasure hunt! I'm hosting a Black Friday special at my shop too 15% off of the regular retail price of $60 on all hand painted glass ornament sets. My whole shop will also go on sale on Monday with everything reduced from 10% to 15% off. and now I'm off to check all the links in your comments. Ooh fab sales! Off to check them out. I'm having a sale too! 15% to 30% off my entire shop until 9 am tomorrow. Make that - http://www.etsy.com/shop/modernemotive Oops. I sell hand knit cowls, scarves and mini bows. Thanks so much for this...I was able to get some Olive Manna stamps I've wanted for awhile. If the blue coat isn't on sale why is it posted?